Diagnosed with Stage IV thyroid cancer at 12, Hazel was prepared to die until, at 14, a medical miracle shrunk the tumours in her lungs... for now. Two years post-miracle, sixteen-year-old Hazel is post-everything else too; post-high school, post-friends and post-normalcy. And even though she could live for a long time (whatever that means), Hazel lives tethered to an oxygen tank, the tumours tenuously kept at bay with a constant chemical assault. Enter Augustus Waters. A match made at Cancer Kid Support Group, Augustus is gorgeous, in remission, and shockingly to her, interested in Hazel. 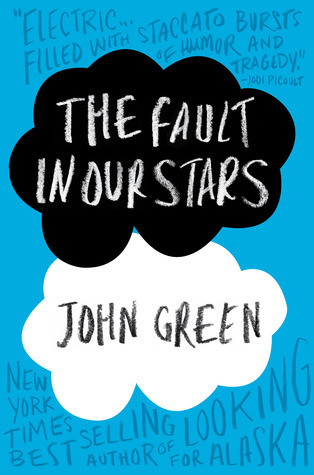 Being with Augustus is both an unexpected destination and a long-needed journey, pushing Hazel to re-examine how sickness and health, life and death, will define her and the legacy that everyone leaves behind. There is a lot of hype with this book. Serious hype. When Penguin sent this for review this week I thought, "well, here goes nothing!" 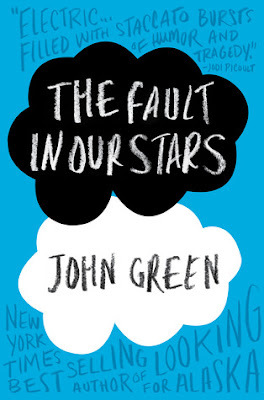 John and Hank Green are on tour in the UK right now so what a better time to read it when the author is so close? I've never really been into cancer books. I read to escape and kids with cancer just breaks my heart. I didn't want it to be so sad that I was just sobbing my eyes out. I was pleasantly surprised. The writing is top notch. Just beautiful. I can see why this books has been on the NYT Best Seller list for so long. The writing alone is gorgeous. It felt real too. The dialogue between mother/daughter, boyfriend/girlfriend and friends just flowed. Getting the dialogue of a teenager can be tricky. It has been awhile since I was a teenager, but this sounded spot on to me. Hazel has cancer. It will take her life. The drugs she is on are only prolonging her life for the moment. Yet, she seems well adjusted. Whatever that really means for a cancer patient?? Augustus has been cancer free for 14 months, but he's lost a limb. One is sick, the other is not. Their friendship blooms in the midst of it all. There is a small romance. Of course, how could there not be? This story is so much more than a tragedy. It is a cancer book people. Don't tell me you don't know what is going to happen. It is full of these little life lessons. "The world is not a wish granting factory." Stuff to ponder and some of it makes you want to scream, "WHY?!?!?!? IT ISN'T FAIR!!" Life isn't fair. It isn't. What a beautifully written story. It deserves all the praise and glory it is getting. I thought it was so nicely written and well-paced too! It was lovely. I found myself smiling more than crying, but I loved how it felt rich and profound and all sorts of wonderful.